Since their 2010 The Bones Of This Land Are Not Speechless split with The Meads Of Asphodel I've been waiting for more material from Old Corpse Road, and their debut full-length is an excellent example of British black metal. Taking a page from the books of the likes of Winterfylleth with the lyrical focus on British folklore and mythology, musically the band differ considerably, being far more reliant on keyboards and less traditionally black metal. As the surprisingly un-hammy spoken intro shows, this band have a good grasp of atmospherics, backing the words with choirs, tinkling piano and ominous orchestral flourishes, before first track proper The Cauld Lad Of Hylton roars in, blastbeats and guitar riffs prominent. It's like a strange fusion of early Emperor, early Cradle Of Filth, and Meads Of Asphodel, snarled and growled vocals in a call-and-response style above a restless, furious instrumental base. There are frequent changes in tempo, moments where the guitars vanish altogether, spoken vocals, acoustic interludes, ambience, orchestration, and wordless vocal chants, and somehow Old Corpse Road manage to throw all this together in a seven minute track without making it seem haphazard or amateurish at all. Moments like that towards the end where the guitars pick up the choral melody are very effective, and it's clear a talented songwriter (or five!) reside in this band. Speaking of the band itself, all provide vocals and although it's hardly what you'd call technical the music itself is quite professionally-played for black metal. I'm not sure whether they'd place themselves into the 'English Heritage Black Metal' camp (is there even an English heritage as compared to, say, a Celtic or Saxon heritage?) and the folk elements seem restricted to the topic and limited musical elements such as chants. Black metal itself seems a far better touchstone from listening to the likes of the nine-minute Hag Of The Mist, even with the clean vocals and what is pretty much a chorus. Blastbeats, shrieks, keyboard ambience, all are present and correct, and although guitars are closer to heavy metal than black at times, there are clearly moments influenced by the Eastern European likes of Drudkh. Unlike Winterfylleth, though, these are just one moment in many rather than the foundation of the music overall. 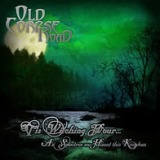 In some ways Old Corpse Road's breadth of vision is one of their main strengths, as it makes for a varied and interesting album - the ambience and lush acoustic strumming of The Buried Moon is following by the group chants of The Wild Voice Came, both acting as interlude pieces before The Crier Of Claiffe, probably the album highlight with its story being the clearest told and supported best by the music itself, although Isobel - Queen Of Scottish Witches isn't far behind. The formula in general sticks closely to longer 'songs' with much shorter interlude pieces, and it makes for an interesting whole. Listening to the split material again, it's clear that Old Corpse Road have progressed considerably. 'Tis Witching Hour... isn't so much an album as a collection of folk tales set to music, and it's when the band make this clearest for the listener that the band are at their best. In some ways this is like a less horror-oriented Carach Angren or The Vision Bleak, although Old Corpse Road are very hard to pigeonhole, and indeed I'm doing them a disservice to even try. Worthy of your ears, this is ultimately a very good opening from a band I hope to be hearing a lot more from in the future.